This editorial was published in the Sri Lankan Guardian on 31 March 2015 Congratulations! Outside validation is always good. Near the end of this year, the International Monetary Fund’s (IMF) will consider adding the yuan to its in-house basket of currency reserves. The basket, called Special Drawing Rights (SDR), represents claims on reserves that the IMF holds and allocates to member nations. The approval of the yuan would mark a significant step in an ongoing process by China to increase the international presence of its currency, also called the renminbi (RMB), and would put it on par with the other SDR currencies. Currently, the SDR basket consists of U.S. dollars, Euro, pound sterling, and Yen, which the IMF reports as 47%, 34%, 12%, and 7% of the distribution, respectively. When the IMF reviewed the SDR basket five years ago in 2010, the international organization denied China’s push to include the yuan due to the currency’s lack of convertibility. In other words, it wasn’t widely used enough to be considered freely useable. Since then, China has made substantial efforts to meet the IMF’s convertibility criteria and has resulted in significant internationalization of the currency. Already, China has established 15 offshore clearing centers—in cities including London, Hong Kong, Switzerland, and Sydney—as well as swap agreements with 28 central banks. Last November, the global payment provider SWIFT ranked the RMB 5th in the list of currencies used most in trade, up from 21st three years ago. The rapid rise of the yuan’s popularity in the global market is hard to ignore, but should you invest in it? For the globally minded investor, the answer is a resounding yes. Having only opened its economy to international trade four decades ago, China ranks as the world’s second largest economy, which carries with it an abundance of opportunity for investors. These opportunities have typically been restricted to outsiders, international investors have seen an increasing amount of access to Chinese capital markets and direct investment in recent years. Under the country’s Renminbi Qualified Foreign Institutional Investor (RQFII) program, China has already allowed ten countries to purchase RMB-denominated “A-shares,” which represent China-based companies traded on the mainland stock exchanges and had originally been limited to domestic investors only. Last year, China also became the largest recipient of foreign direct investment, with net inflows of $128 billion, while the United States’ inflows fell by two thirds to $86 billion, according to the United Nations international trade body (UNCTAD). As China continues to make the yuan more freely usable over the coming years in hopes of maintaining sufficient convertibility for inclusion in the SDR basket, investors will likely enjoy much wider access to the nation’s markets. The benefits of a more convertible yuan aren’t restricted solely to investments within China’s borders. The greater prevalence of the yuan in world markets has also enabled Chinese investors to bring their capital abroad. The many Chinese companies that seek investments outside their country are more able to trade in their own currency instead of converting revenues back into the yuan through the foreign exchange markets. Chinese companies would be less susceptible to volatility in foreign exchange prices and thus have more incentive to invest internationally. For other nations, this would mean access to an abundant source of capital. The Chinese government reported that, in the past year alone, outbound direct investment grew more than 14% to $102.9 billion. The European Union has been a major beneficiary of outbound investment from China. At the peak of the EU debt crisis, while most investors fled the continent and took their money with them, China-based companies surged into some of the hardest-hit countries and provided cash when others would not. Many of China’s European trading partners have benefited from the yuan’s internationalization, which has provided access to China’s mainland markets as well as capital from Chinese investors. As a result, the UK, Germany, and France are all competing to become the European hub for Chinese investment and yuan trading. Some may worry that globalization of the yuan will lead businesses to be more susceptible to the influence of the Chinese government, which has typically maintained a tight control over its national economy and currency. This concern, however, is why investing in the yuan is all the more important. As international businesses take advantage of the growing accessibility to China’s markets, the nation’s government will be inclined to continue efforts to bolster global confidence in the yuan’s convertibility. Within the near future, one can reasonably expect the yuan to play an increasingly dominant role in international trade. Should the IMF accept the yuan into the SDR basket later this year, China and its currency will become even larger players in the world market. For the global investor, now is the time to take advantage of this trend and become a part of the rapidly growing yuan market. Kevin Ma is an undergraduate student majoring in Finance and International Business at Georgetown University’s McDonough School of Business. During his 40-hour visit to the Chinese capital, Lew met Premier Li Keqiang, Vice Premier Wang Yang and a number of other high-level officials. Lew discussed the upcoming S&ED — talks involving high-level officials on a range of issues — the yuan exchange rate, the fiscal situation of the U.S. and the progress of the Trans-Pacific Partnership (TPP) negotiations. You emphasized the importance of safeguarding U.S. leadership in the IMF, and it represents the multilateral approach the Obama administration has been advocating. What is your take on some new initiatives proposed by emerging economies, such as the Asian Infrastructure Investment Bank? Over the last, post-World War II period, we’ve developed a number of multilateral organizations that are critically important to economic and financial stability. The IMF is a leading one, and we are committed to ratifying the 2010 IMF reforms, but the regional banks and World Bank are very significant multilateral commitments that have established track records of making certain that there are standards in place that are effective in terms of reaching goals, but also making sure that there are appropriate protections. We look forward to learning more about the proposals that have been coming forward, but I think that questions we would ask are: how do they build on or add to the work being done by the existing multilaterals, and how do they address the concerns of standards that have been well-addressed … and we look forward to learning more about it. The authors of the survey, conducted by the Economist Intelligence Unit and commissioned by State Street financial services, polled 200 senior executives at institutional investors with knowledge of their exposure to yuan assets. Half of the respondents were from the firms headquartered in mainland China (including Hong Kong and Taiwan) and the other half were based elsewhere. The report accompanying the survey points out that by the end of 2013, the yuan has risen to become the second-most-used trade financing currency and ninth-most-used currency for payments globally. A majority – 53 percent of respondents said that they believe the yuan will one day surpass the dollar as the top currency in international holdings of foreign-exchange reserves. In China 62 percent expressed this opinion, compared to 43 percent of respondents outside the country. Last May International Monetary Fund analysis showed that the dollar had slumped to a 15-year low, heightening concerns that it may lose that status as global reserve. Chinese officials are diligently working on sustaining their national currency, promoting it beyond the frontier. In October 2013, the government of China agreed a pilot program to create a UK based yuan hub that allows London investors to buy up to $13.1 billion (80 billion yuan) of stocks, bonds and money market instruments directly, avoiding Hong Kong transactions. The move gave the yuan a firmer footprint in Europe and helped to overcome the euro in December, becoming the second most widely used currency in global trade. 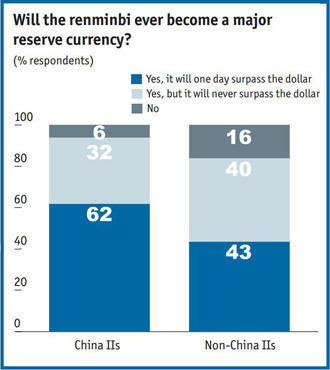 Only 11 percent of respondents have said that they do not expect the yuan to become a major reserve currency, a split between 16 outside China and six onshore, according to the poll. Among the former, the most often cited reasons are that the yuan will never enjoy enough liquidity across all asset classes to offer a viable option as a reserve currency, and that people will not trust the yuan as a store of value, the survey says. But the consensus is that one day it will be a yuan world, according to the survey. “As China’s economic influence grows, the global importance of the renminbi (yuan) will become magnified. Indeed, while for decades it has been a ‘greenback world’, dominated by the US dollar as the world’s primary reserve currency, many think a ‘redback world’, in which the renminbi enjoys premier status, is increasingly a possibility,” the survey’s authors concluded.